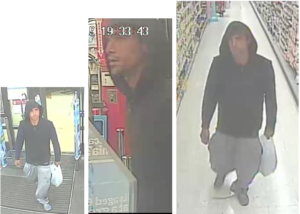 The Palm Beach County Sheriff’s Office is seeking the public’s assistance identifying a suspect WANTED for stealing several bottles of body wash from a local Walgreens. An unknown male entered Walgreens and proceeded straight to the hygiene aisle where he placed the bottles of body wash into a plastic bag he was carrying. This incident occurred on January 30, 2019. Walgreens is located in the 500 block of South Dixie Highway, Lake Worth.